Oracle background processes bound across all cpus using pbind. Installed ipge driver patch 120849-02. This system was divided into 3 equal logical partitions using Solaris Containers. This system was divided into 4 equal logical partitions using Solaris Containers. Automatic segment space management was used for all tablespaces. The M_INVENTORY table was horizontally partitioned. System managed undo was used. the two Sun StorEdge 3510 arrays. server logs and filestore for JMS persistence. This extrapolates to 105 GB of storage for a 24 hour run. The database is configured with 2628 GB of storage. 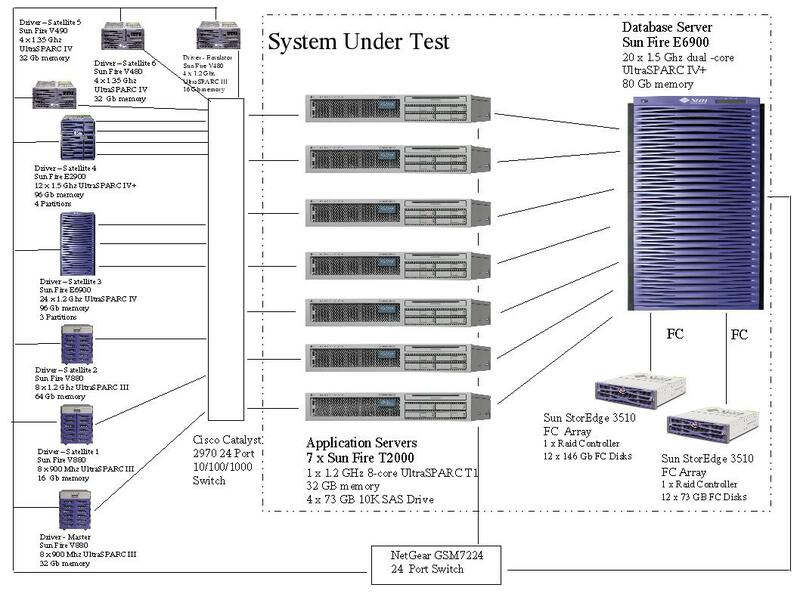 Each Sun StorEdge 3510 FC Array was configured as a single RAID 1 logical drive. BEA WebLogic 9.0 uses pass-by-value as required by the EJB Specification. This submission used the xerces implementation 2.6.2 provided with WebLogic 9.0. The only errors in the driver log files were those that are normally generated by this benchmark. For questions about this result, please contact the submitter: Sun Microsystems Inc.